…for The Plant-Based Journey, it would be that she (1) go into second printing quite quickly, (2) be reviewed by a major publication such as VegNews, and (3) that she have marvelous photos of the recipes she contains. While the first two have already happened, recipe photos in the book were not to be. Journey is designed as an instructional behavior change guide and the decision to focus on this robust vision prevailed over the more cumbersome, much costlier “picture” book. …the Plant-Based Journey blog tour delivered multiple photos of Journey recipes that are far better than any I seem to be able to produce in my own kitchen. 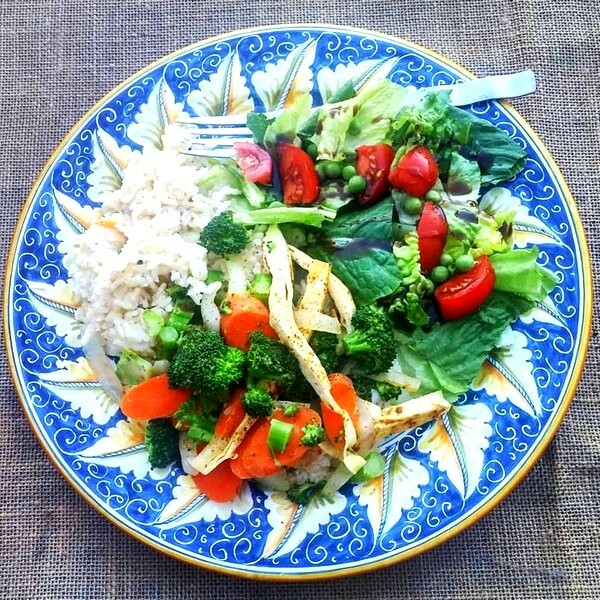 The food looks just as good at my house, but the pictures…well, how do they do it, anyway? What follows is a collection of several of the recipes featured in The Plant-Based Journey as prepared and photographed by several readers, bloggers. and even friends via facebook. Each of the bloggers has been identified and their blog been linked. You’ll even find some of the recipes detailed on those very same blogs. I’ve also included a few snapshots that I have taken myself, just to give you as many pictures as possible! May they inform and provide inspiration for your table as we move into the holiday season. And if you haven’t had a chance to see my CBS TV Plant-Based Living Series, they are another way to get a visual on some of the recipes, templates, and food preparations from The Plant-Based Journey. Segment one is Five Fast Ways to Plantify Your Plate, and segment two, Whole Food Plant-Based Holiday Eats. My only regret is that I ordered your book on kindle. Not a good idea for recipes! I would suggest that you mention this on the web that it’s better to have a hard copy. Your book has been one of the reasons I’m still doing this. You’ve broken it down so easily and painlessly. 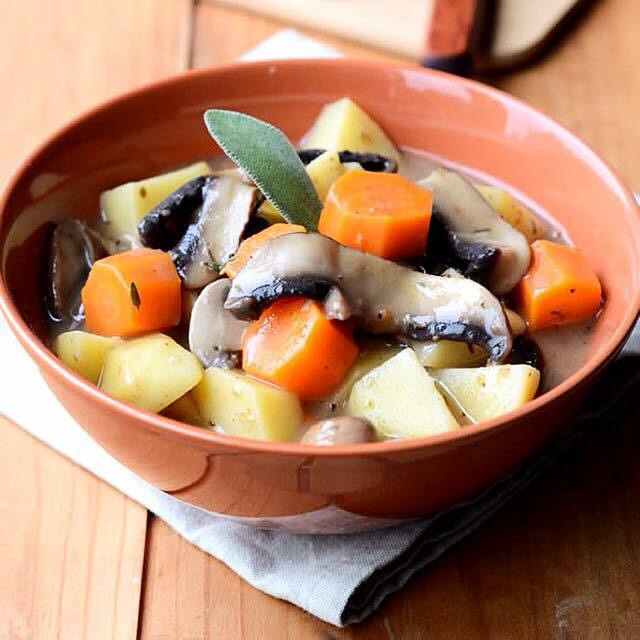 The snapshot of Portobello Pot Roast at the top of the page was taken by Melanie, who writes from Victoria, BC for her blog Virtual Vegan. At left are two more snapshots of the Portobello Pot Roast taken by Australian blogger Emma Roche (top) for her blog Plant Plate and choclatier Pam Lowe-Hartley of Joy Lyn’s Candies. 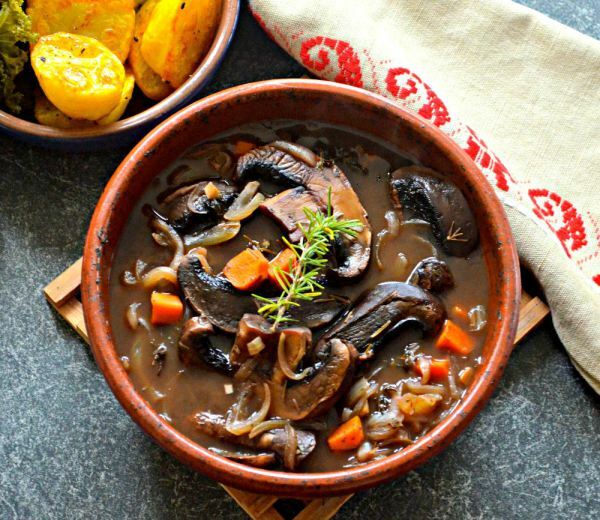 The Portobello Pot Roast recipe is in Journey in the “Crowd Pleasers and Can’t Misses” chapter – because that’s exactly what this dish has turned out to be. Who doesn’t remember savory Pot Roast as a family comfort-food meal from childhood? I’ve simply plantified it, taking out the animal products, oils, and processed foods. Several of the recipes testers who tried this one out during book manuscript preparation asked to make this one – with winning results for the whole family every single time. It’s fun to see the variety in their results. 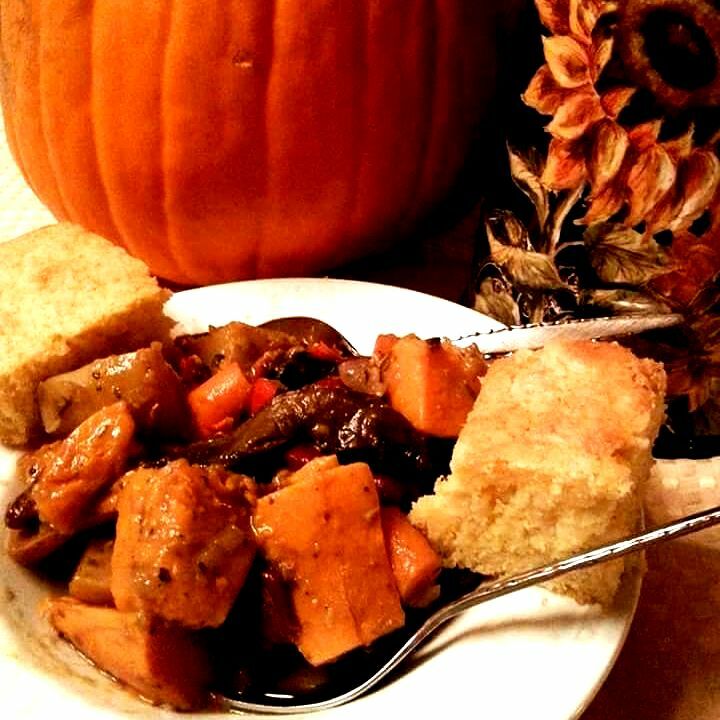 Some chose to use sweet potatoes, cut the vegetables into bigger chunks, and otherwise vary the pot roast theme. By the way, you’ll find the Journey recipe for Portobello Pot Roast online at both of the blogs linked above. The benefits of blog tour! 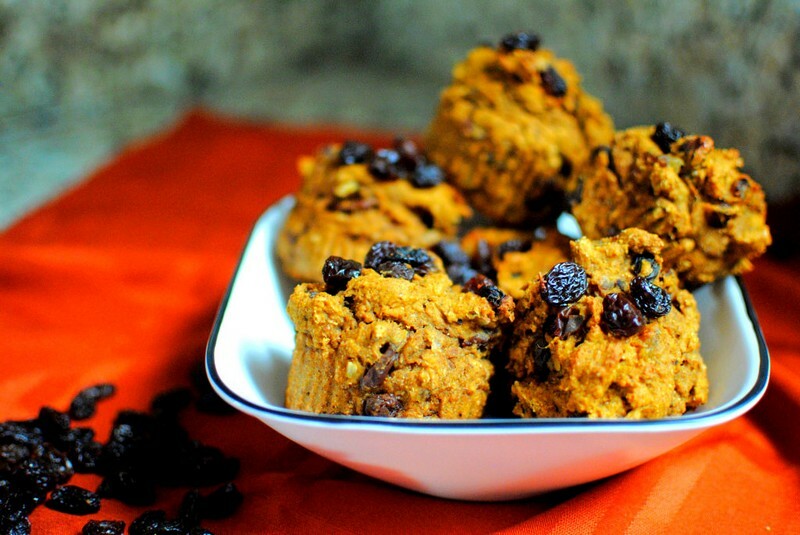 I’ve made Pumpkin Muffins at least a couple of dozen times now, and they are always a hit. 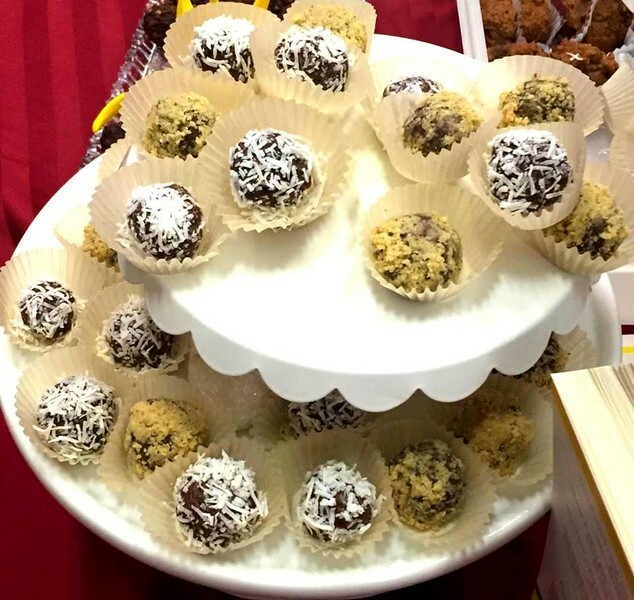 I make them for book signings, presentations, and any where I want to be able to hand someone a guaranteed taste treat that sings to the taste buds and warms the heart – all with whole plant food ingredients. But no one has captured them in photos quite as exquisitely as Emily on her blog Gathering Green. You’ll find the recipe posted there, too. Game Changer Chili is so named because it changes the game about what you demand be in your chili. 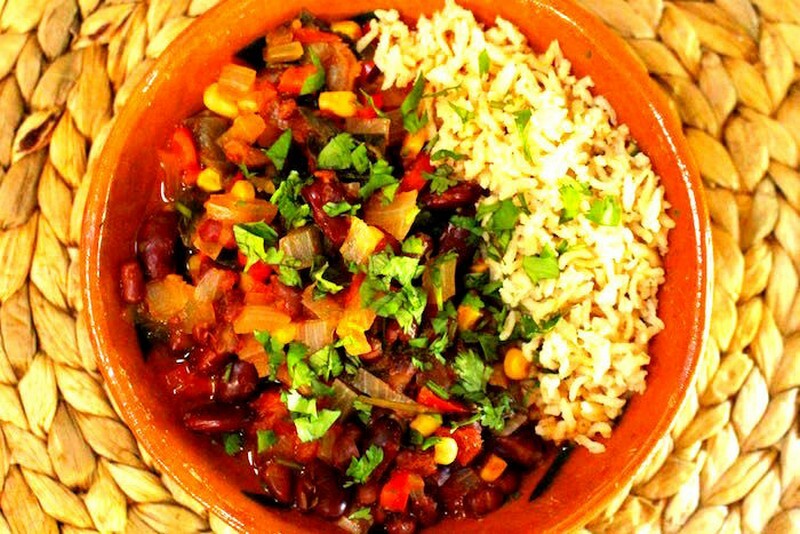 Who doesn’t love chili? And if you can make it in a way that is absolutely delicious, textured, and full of color, without causing harm, why wouldn’t you do that? The batch of Game Changer Chili was cooked up by talented plant-based chef and cooking instructor Katie Mae, and featured on her blog Plant-Based Katie Mae. The secret to success in this recipe is not only the simple yet extraordinary blend of spices, but the crumbly texture provided by the bulghur wheat, which you can replace crumbled beef or turkey with to excellent results.And if you prefer not to use wheat, you can substitue quinoa – that’s what Katie Mae did in her version. 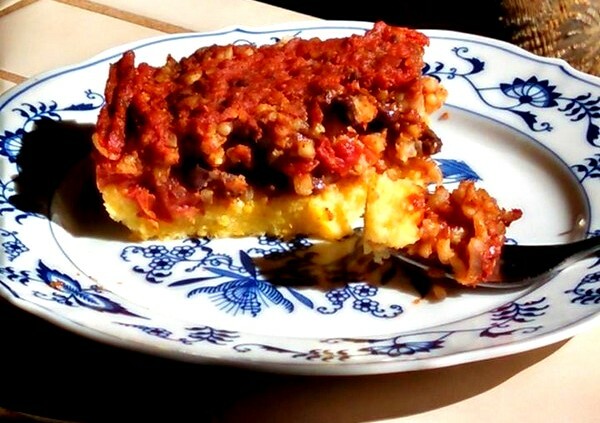 I usually bake Country Comfort Cornbread in a pan, then slice it into big squares to next on top of a bowl of Game Changer Chili. On this occasion, however, I was preparing the recipe for the CBS TV segment PlantifyYour Plate. 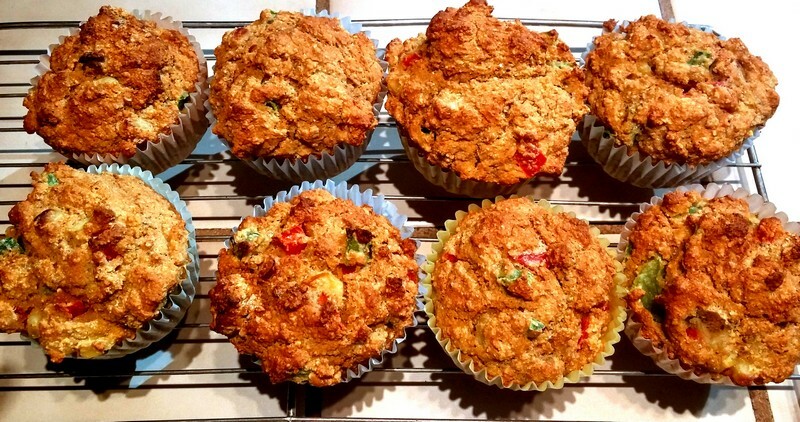 I wanted easy grab-and-go style muffins. 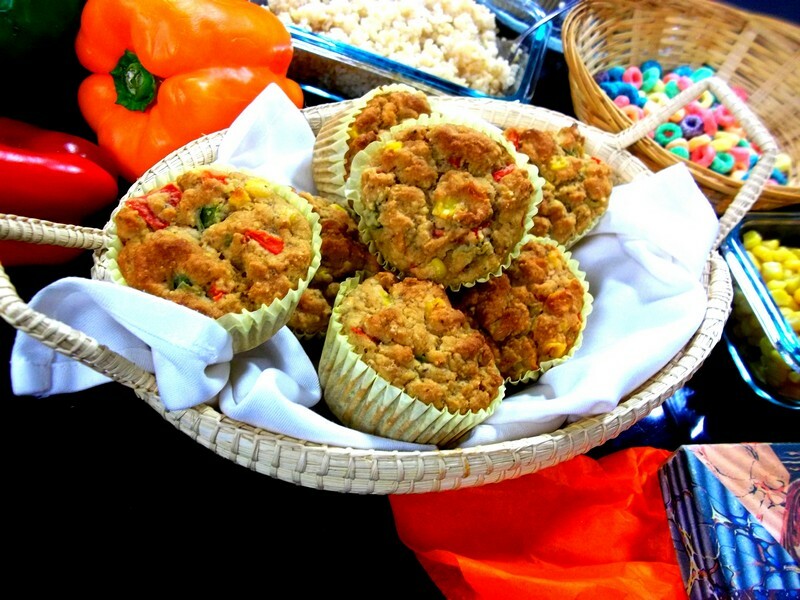 I was also demonstrating how to further ‘plantify’ your plate by adding chopped fresh yellow, green, and red bell peppers to add to the cornbread batter, along with the whole corn kernels as listed in the recipe in Journey. You can see the extra bits of color in the muffins pictured, first on the cooling rack and then in the basket for the TV segment. Puzzled by the bowl of fruit loops in the bottom photo? You have to watch the TV segment to get that. Black Bean Polenta Pie just happens to be my number one go-to for dinner guests, potlucks, and family events. This is because of its proven track record of having universal appeal for people of all dietary persuasions. I’ve yet to serve this to vegans, vegetarians, or omnivores without being asked for the recipe. Though it has multiple layers, it is one of the simplest main dishes I know how to make. Perfect for lazy cooks like me. 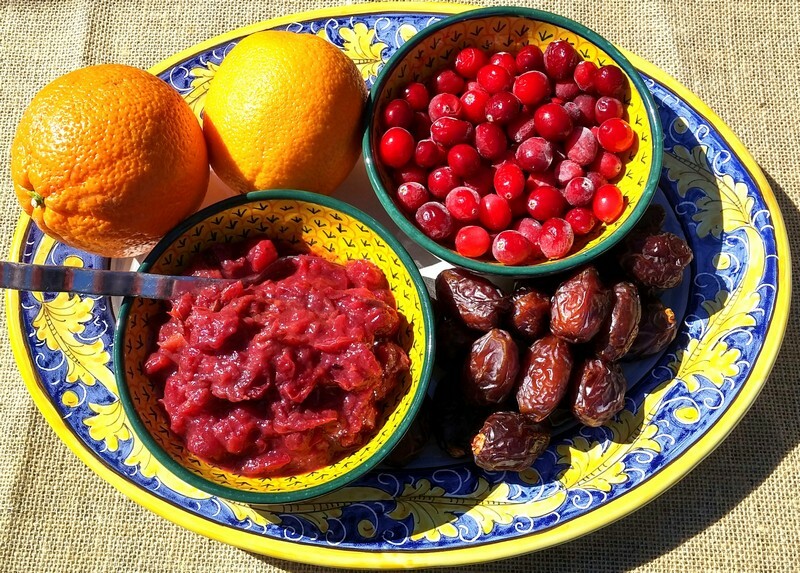 All the ingredients for Cranberry Orange Date Sauce you see on the platter next to the finished product. This was the first thing that Marianne McClary, news anchor at Good Day Sacramento, tasted during the Whole Food Holiday Eats CBS TV segment. 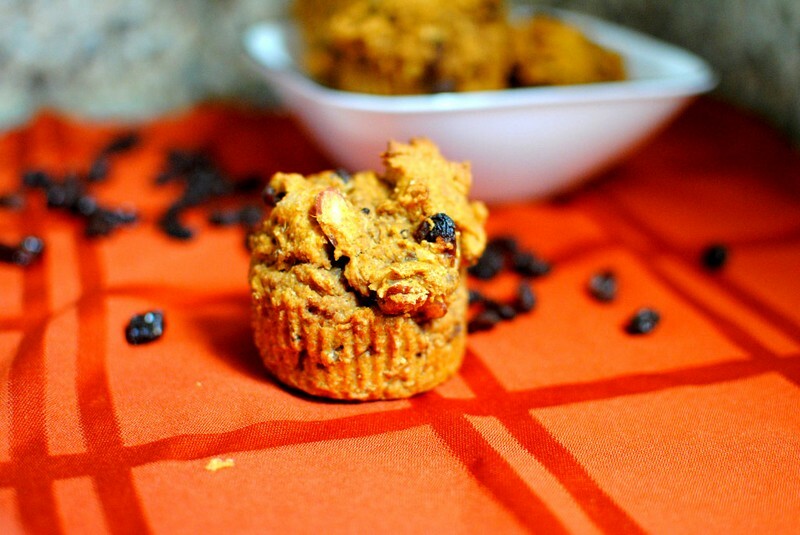 It was love at first bite and things just kept getting better as she tasted Pumpkin Muffins and the Apple Crisp. Forgot to take a picture of the Apple Crisp! D’oh! The Savory Vegetables Template was based on my go-to method for cooking vegetables. This simple preparation method magnifies the color and brings out the flavor of any frozen vegetable and never fails to satisfy. And it doesn’t call for oil or other fats to bring home the taste. In this snapshot the Savory Vegetables are in the bottom left third of the plate, surrounded by fresh spinach salad and brown jasmine rice. 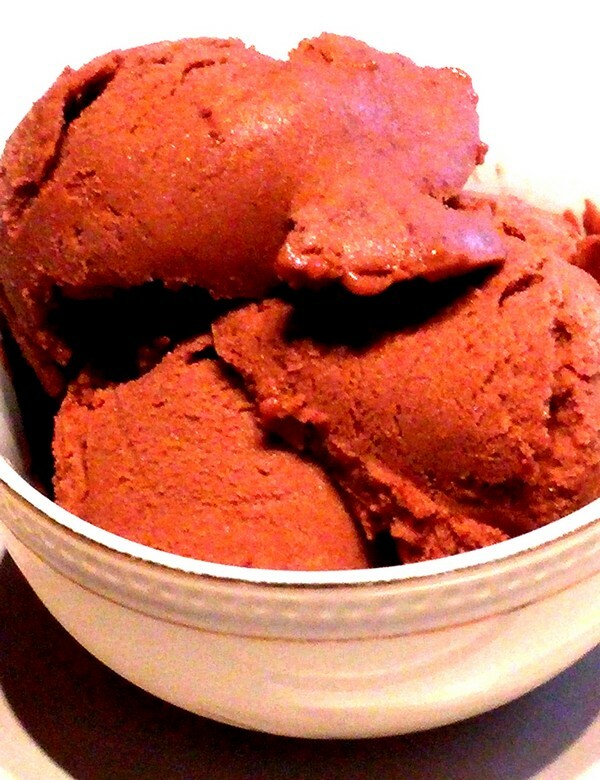 Mandarin Chocolate Ice Cream is my dairy-free, whole foods version of a childhood favorite. This can also be served soft-serve style. Yet if I have the presence of mind to make it earlier in the day, it scoops up beautifully into bowls or piled on a piece of birthday cake (above). Double Chocolate Cherry Truffles are as good as they sound. 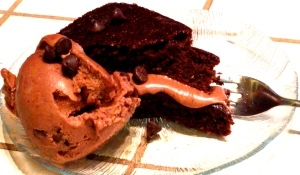 Whole foods deliver when it comes to dessert, too! There you have it! When you dive into the recipes and templates in The Plant-Based Journey, I’d love to see snapshots of your creations! Please tell me what you’re cooking in comments below, and then send your snapshots to me so we can start building more pages of Journey eats! Wow Lani, it’s so great to see all of these photos! I’d caught bits and pieces of the blog tour, but hadn’t seen all of them and it looks like there are some pictures you took that I hadn’t seen before either. My book just arrived so now I’ll have so ‘visuals’ to go with the read. Thank you for posting this! Shelly, thanks, it is good to see them gathering in one place! I am so grateful to friends and bloggers who have taken the time to snap photos and send them to me for all of us to enjoy. Have fun diving into Journey! All of these look so yummy! 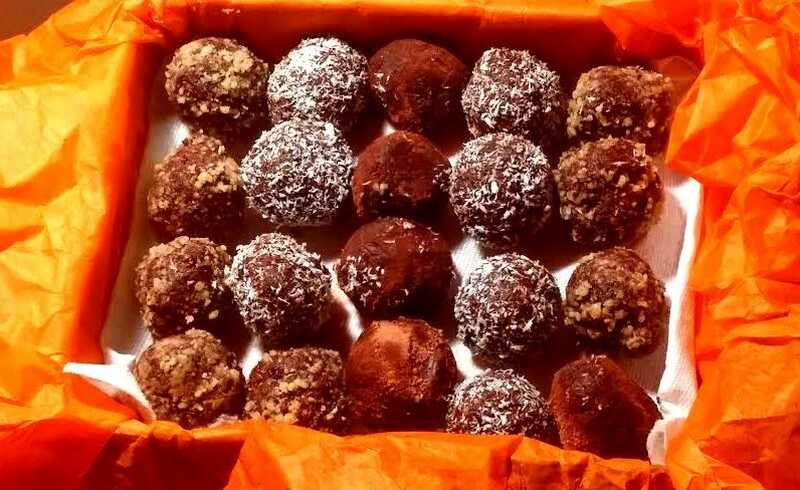 The truffles would be a great hostess gift for all those holiday parties. I think I’ll have to make them for myself today. Lynn, that’s a brilliant idea! As a matter of fact, I’m going to add that to the article pronto. Thanks! No that your publisher knows what a hit this is – they might want to issue the “gift” edition – with those gorgeous photos! Now there’s a thought! How innovative Margaret and thanks! I made the Portobello Pot Roast last week. It was a hit! Looking forward to trying more of the recipes. It is nice to have visuals. Photos do draw you in to the recipes. Deborah, this is great news! I’ve never seen this recipe fail. Did you take a picture by any chance? Thanks for reporting in!